If 2016 was the year of the platform, 2017 is the year of the subscriber. Amid a backdrop of political change, wavering trust in government and media, and the rise of fake news, subscriptions are up among the largest U.S. publishers, proving that consumers value high quality journalism. According to Pew Research, the numbers show that in 2016, The New York Times added more than 500,000 digital subscriptions – a 47% year-over-year rise, and The Wall Street Journal added more than 150,000 digital subscriptions, a 23% rise. Even Facebook recently announced that it’s building a feature that would encourage readers to subscribe to news publications, in response to publisher interest. And this trend isn’t going away. 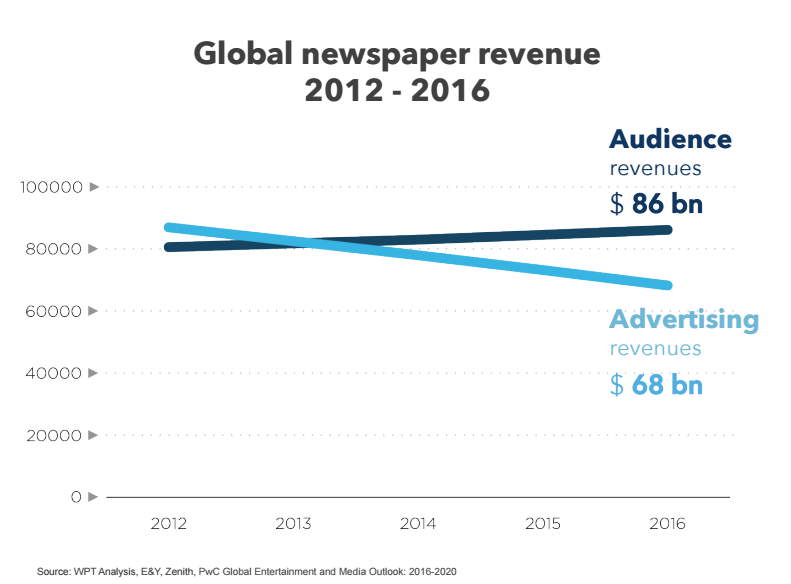 According to WAN-IFRA’s 2017 World Press Trends report, understanding paying commercial models is the number one priority of publishers this year, particularly as audience revenues surpass advertising revenues among global newspapers. While the industry rightfully focuses on growing new subscribers and experimenting with business models, the discussion should not end there. What we’re not talking enough about is that subscribers are a distinct audience. They engage with your content in a different way and are loyalists in a different way. Understanding these differences is where publishers will build their revenue strategies to take their businesses to the next level. No one will pay for content that doesn’t repeatedly engage them. Loyal readers, which on average account for the majority of pageviews across all channels, have time and time again proven to be your most valuable as they consume more of your content. And what is that link between loyalty and subscriptions? Active engagement. A recent report by the MIT School of Management, Turning Content Viewers Into Subscribers, presented the Subscriber Ladder of Participation as an illustration of reader lifecycle. Rather than thinking of your reader journey in a passive way, it encourages you to build your strategy around action: moving readers from Anonymous to Subscriber by encouraging them to act. And this active participation is central to Chartbeat as well – our research has shown that analyzing and optimizing the reader experience around engagement patterns as opposed to just empty pageviews drives returning visitors, motivating users to proverbially ascend the ladder towards subscriptions. Subscribers are loyalists who engage with your content in a unique way, and understanding that engagement is key to driving more loyalty. 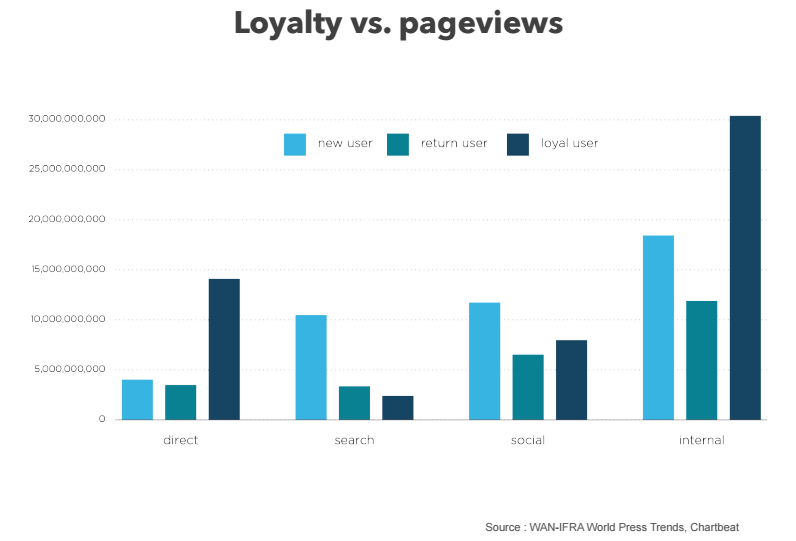 Besides the simple fact that returning visitors increase ad impressions, they also represent a crucial point in a publisher’s subscription funnel. Every new visitor is a potential subscriber, but — to put it bluntly — no one will pay for content that doesn’t engage them. Once you’ve engaged your subscribing audience, you need to focus on keeping them and getting more. To do this, you need to study how they engage and drive like-behaviors in your loyal/returning audience to turn them into subscribers. In other words, publishers need to start thinking about taking their data past the point of conversion. Once a reader has subscribed, are you continuing to dig deeper into their behaviors and deliver the content that they have demonstrated a complex interest in? 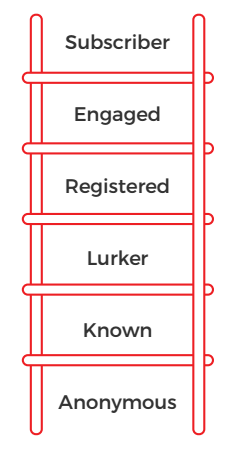 Discover not only what content your subscriber communities engage with, but think of subscription status as another lens to evaluate all of your editorial strategies — from social media channels and platforms, to devices and portals, and even relationship-building campaigns. At the end of the day, understanding new visitors and their journey to return is important, but garnering deeper insights around how subscribers engage with your content differently can unlock durable retention and growth strategies for publishers across the board. Terri Walter, the Chief Marketing Officer of Chartbeat, works every day to ensure that publishers and newsrooms have the tools and insights they need for quality content to thrive. A digital marketing veteran of 20 years, Terri has worked over the course of her career to position high potential brands and spearhead thought leadership in media and analytics at companies including DoubleClick, Razorfish and Microsoft Advertising.